The sarees of each place in India in some way or the other bears the mark of its history, its people and its geographical location and Kerala is no exception. The first image that floats into our mind at the very thought of Kerala sarees is that of an off white saree with a broad striking golden border in real zari or tissue, that makes a simple yet stunningly bold statement. 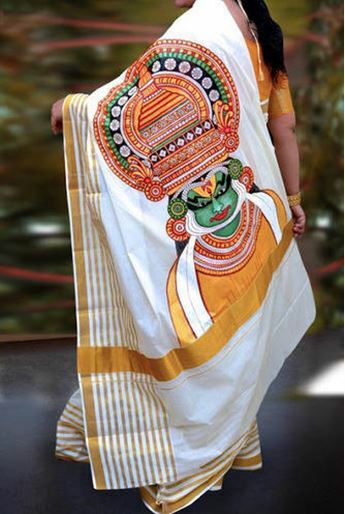 The swaying palms and the backwater , the Kathakali dancers, the sandy beaches, and the land of plenty filled with vibrant colors actually has a saree that is mostly plain white, cream and gold-which is all the more reason for it being so distinctive. While the predominant colour in most sarees from Kerala remains white and off white, there have been huge innovations-perhaps a look at the traditional first and then the innovations make the journey of Kerala’s sarees a little more clearer. The Kuthampally sarees are also a type of Kasavu saree that is popular as the most well known traditional wear of women from Kerala. This village having 600 families makes a living out of weaving the set sarees, mundus and Kasavu sarees, live barely 100 kms from the bustling city of Cochin. They have been weaving this fabric for centuries and have made slight innovations in their designs. The floral depiction on the pallu and the usage of red and gold marks the Kuthamapally as a distinctively different saree from what is generally made in the rest of the region. As you can see in the pictures below the usage of flowers and peacock happens to be some of the most popular traditional motifs used in Kuthampally sarees. Perhaps one of the lesser identified sarees of the Malabar region which is perhaps one of the weaves that brings in more color than others is the silk woven solid border design sarees called Kasaragod Saree. Like in the case of the Kasavu, the Kasaragod uses dyed silk yarn and zari in its pallu designs. The body of the saree could have either checks or hand laced designs. There are in fact 25 colors used in Kasaragod sarees much in contrast to other handlooms from Kerala. In fact the weavers of this region had migrated from Mysore many years back and there are certain similarities in the saree worn in the two regions even till date. Apart from sarees they also weave the famed Settu Mundu-the half saree like dress worn by women from Kerala for all their major ceremonies. The difference of course being that the mund is a dhoti like dress worn over a petticoat topped of course with a blouse and a drape that looks so much like a half saree. The saree woven here are pure cotton with a simple gold zari border and pallu with little or no embellishments. The weave is very light and at times quite coarse so as to aid its wearing in the highly humid climate. The Balaramapura weavers gained a lot of respect in society because they had been brought by the Maharaja of Travancore all the way from Tamilnadu to specially weave textiles for the royal family and hence the place of glory. 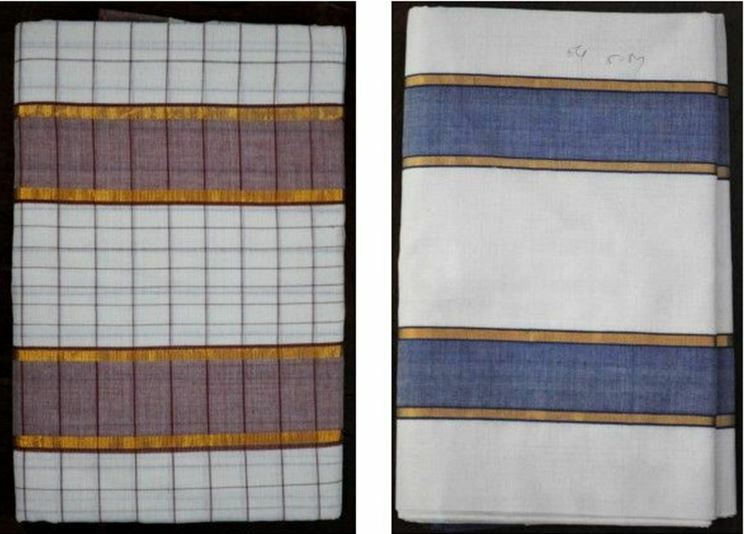 Settled by the patronage of the ministers to the royal family of Cochin , the Chendamangalam weavers too are a class who have survived the travesty of time and continue making replicas of the sarees and set mundu that they have been making for centuries. The only difference in their sarees being that they have less ornamentation as compared to the Kasavu from Balarampuram sarees and come with lighter colors on the border and sometimes even in the body. The textile too is coarse and heavier and has hardly any usage of kasavu or zari. In the recent times there has been an urgent and growing need seen amongst the young designers who are wanting to retain the tradition of Kasavu along with subtle changes that are not completely deviated from their original patterns and motifs seen in Kerala sarees- and thus emerged the Hand painted Kerala sarees. 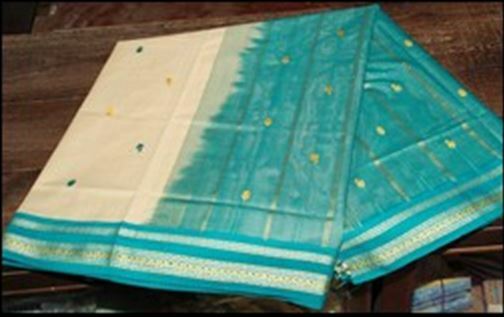 While the usage of silk and heavier zari too has been an innovation, there has been an eager usage of brightly colored paintings on the border and the pallu of sarees. Seen below is one such modern rendition in which nature related art has been incorporated into the saree. The base color remains the same and the vibrant usage of colors all along the saree allows one to wear it with not just gold jewelry and golden colored blouse, but also other colors and other formats. However if there has been an art form that has managed to amalgamate itself in the true meaning of the world with Kerala kasavu , it has been the paintings of murals on sarees. From religious themes to those of nature, each has been explored to the fullest making them one of the most sought after sarees coming from the local artist fo the state. In fcat mots of the murals painted belong to the centuries old mural art seen in the temples of Kerala. The depiction of Vishnu, Krishna, Ganesha are the most popular as are the lotus motifs and the Krishna Radha paintings. Below you can see the gorgeous Kathakali mask and the vibrancy it lends to the saree in the backdrop of off white and gold. 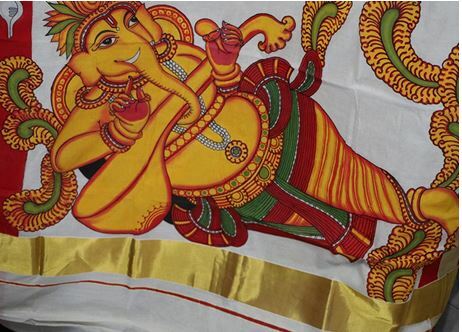 The Ganesha motif has also been exploited to the fullest and today makes its inroads into print, embroidery as well and paintings done on Kerala cottons. The depiction of everyday life on these sarees, like the famous boat races has inspired the saree shown here. The pallu is alive with the swirling water of the lagoons as the snake boat race makes its way down the waterway. 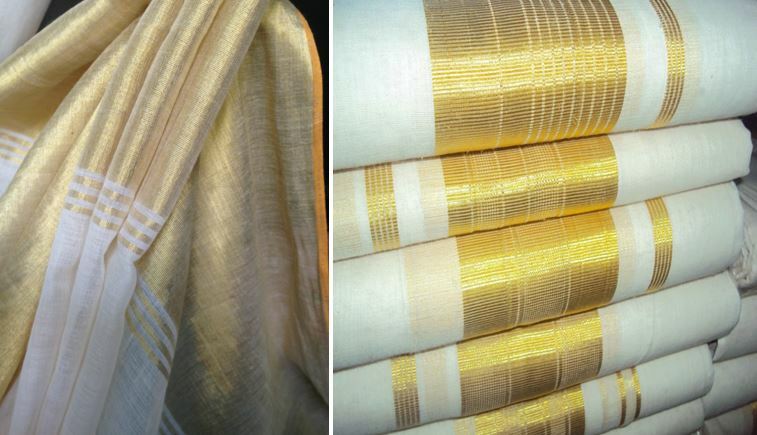 Ultimately, it is in the simplicity of the Kerala sarees wherein lies its beauty which is why apart from some amount of experimentation like this half and half saree in off white attached to gold and black checks in brocade, there is very little that is done to tamper with its ethereal beauty. Its ultimately in its simple beauty wherein lies the charisma of the Kerala sarees, and every effort should be made to keep this tradition alive.